For the latest terms and conditions about the Amway Visa Credit Card designed only for their Independent Business Owners (IBOs) only, visit this online page which gives a link to start the application process. “The Amway™ Visa® credit card is the only card designed to simplify your Amway shopping experience. 0% financing on purchases for one year and no annual fee with your new Amway credit card. 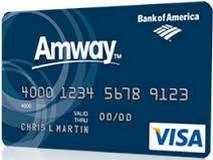 The Amway Visa Card from Bank of America charges zero percent on purchases for the first 12 billing cycles. The credit card also pays rewards for net purchases with your credit card provided a minimum of Point Value and Business Value are met. A Total Security Protection Package is included with the card at no cost to you. Plus complimentary online banking service for convenient and secure information on your account 24 hours a day, 7 days a week. Pay the minimum due each month and watch your cash grow for a year. Of course the balance must be paid in full after the first year to avoid any further interest charges. For details on this generous 0% interest credit card promotion contact Amway via email at their customer service at customer.service@amway.com. Amway VIsa Credit Card Review – Formerly Quixtar Visa Review – Is It A RipOff? LOOKING TO MAYBE GET THIS CARD SOON. MY ADDRESS IS 3001 COMMUNICATIONS PARKWAY 1521 PLANO, TEXAS 75093 ANY PRE APPROVAL PROGRAMS SEND IT MY WAY. THANK YOU. How do I check my account on line? Go to the main Amway web site and click on the register link on top. Once you are registered you can check your Amway Visa account online. How do I request a secondary card? There can only be two cardholders per account: the primary cardholder and a secondary cardholder. Additional authorized users may be added to an account by calling 1-800-362-6299. Call customer service number at 1-800-253-6500 for an update. Only you have have authority to ask about your account. Amway customer service email is customer.service@amway.com. Anybody calling for you would appear to be very suspicious. Credit agencies take identity theft very seriously. Amway VISA credit card applications are handled via email at customer.service@amway.com or phone Monday-Friday 8:00 am to midnight Eastern Time at 800-253-6500. They will guide you through the process. i would like to apply for the amway visa card please send me a information.